Died at her home near Berlin Sunday, her age being 61 years, 10 months and 25 days. She was a daughter of Nicholas and Barbara Schwartz, and had spent her entire life in Holmes county. She was the wife of Michael Sheneman. She had been a member of the Berlin M. E. church for many years. The funeral occurred Tuesday, from her late home, services being conducted by Rev. Rowler of the Millersburg M. E. church. Interment in the Berlin cemetery. “Mrs. Sevilla Sheneman,” Holmes County Farmer (Ohio), 17 May 1917, p. 1. We made brief mention ast week of the death of Mrs. Sevilla Sheneman, which occurred at her home near Berlin on Saturday evening, May 12 after an illness of two months. 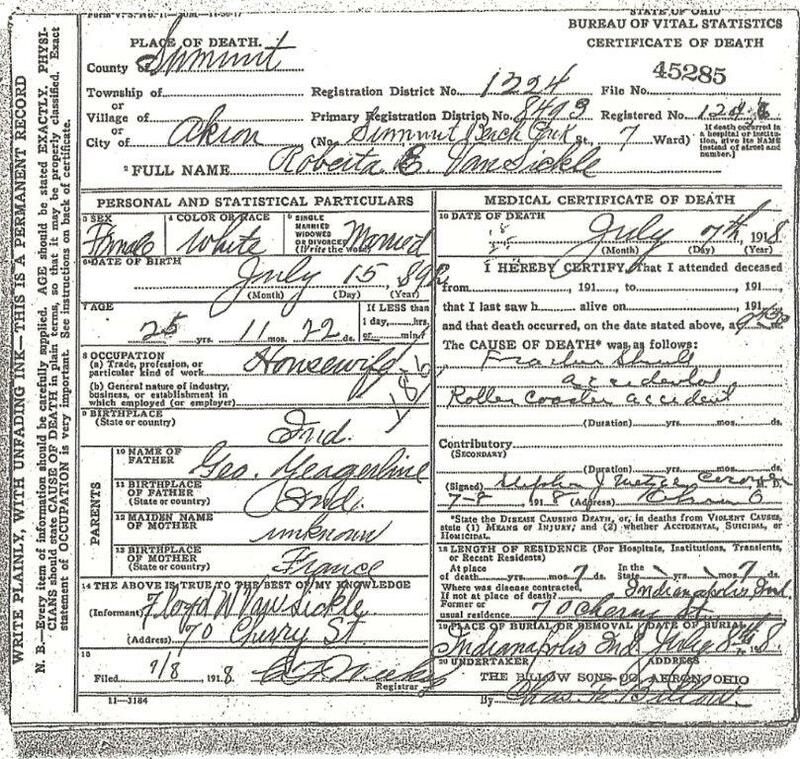 Deceased was born June 17, 1855, on the home farm south of Berlin, where she spent her childhood days. When quite young she united with the Berlin M. E. church and remained a faithful member until death called her. In 1883 she was married to Jacob Engel who preceded her in eath. 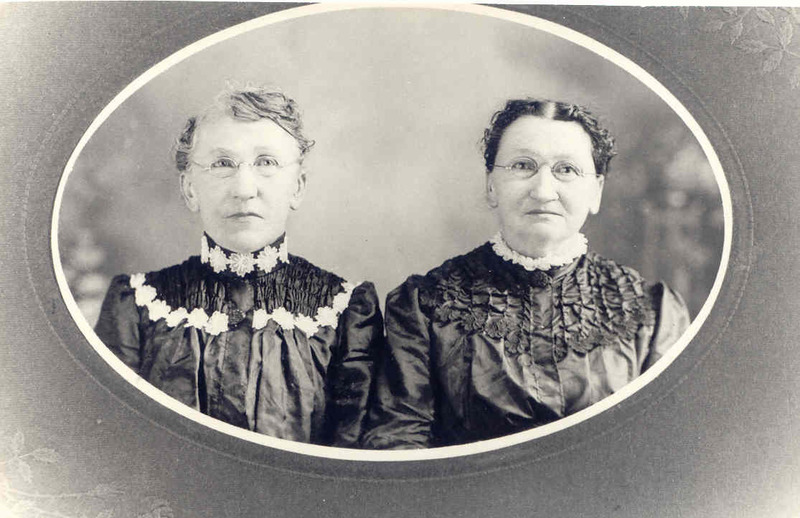 To this union four children were born – Edith, Etta and Frank at home, and Mrs. Wm. Kaser of Charm. 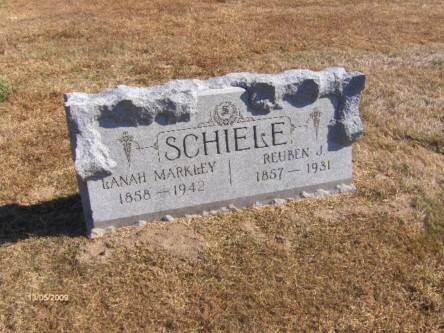 She is also survived by her husband, Michael Sheneman to whom she was married in 1898. Five brothers, one sister and many nieces and nephews are also left to mourn her departure. She was a loving, indulgent mother always thinking of others before herself. Our home is very lonely now but our consolation is that we will meet again. The funeral was held Tuesday, May 15, and internment was made in Berlin cemetery. Those from a distance who attended the funeral were: S. N. Schwartz, Cleveland; Charles Schwartz, Painesville; Mr. and Mrs. C. H. Schwartz and Mrs. Wm. Fulton and family, Sugarcreek; Fred Schwartz, Mr. and Mrs. Ebersole, Mrs. Sevilla Malone and Wm. Schwartz, Dundee; Mrs. A. D. Maxwell, Cuyahoga Falls; Mr. and Mrs. P. E. Steele, Meadville, Pa.; Chester Beachy, Kent; John Schwartz and Mrs. Corwin Decker, Canton’ Mrs. Albert Deuber, Winesburg; Mrs. Charles Kunkler, Wadsworth; T. G. Syler, Baltic; Mr. and Mrs. Walter Lowe and Mr. and Mrs. John Lowe, Bedford. We wish to express our thanks to the friends and neighbors who gave us assistance during the sickness and death of our dear mother, Sevilla Sheneman also for the beautiful flowers and music at the funeral. 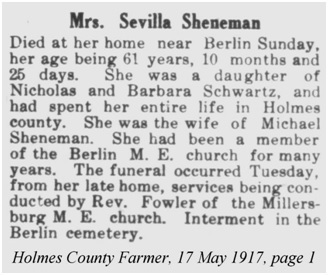 “Obituary of Mrs. Sevilla Sheneman,” Holmes County Farmer (Ohio), 24 May 1917, p. 1. This entry was posted in Schwartz, Sunday's Obituary and tagged Anna Barbara (Kunz) Schwartz, Holmes County, Holmes County Farmer, Michael Sheneman, Nicholas Schwartz, Sevilla (Schwartz) Engel Sheneman, Sunday's Obituary on February 2, 2014 by Deborah Sweeney. The subject of this notice was born at Canton Berne, Switzerland, May 11, 1838, and came with his parents to America, arriving here May 15, 1852. He was baptized May 24, 1838, and united with the Reformed church at Trail, March 27, 1853. He was united in marriage to Mary Rohrer, in 1862, who preceeded him in death July 29, 1903. To this union, ten children – five sons and five daughters – were born, all of whom are living. Besides his family, 8 brothers, 4 sisters, 28 grandchildren and a host of friends are left to mourn his death. His age was 65 years, 9 months and 21 days. He was a kind and loving father, a good neighbor and always ready to help in time of need. We desire to thank the friends and neighbors for their kindly assistance during the death and burial of our father. “Death of John Schwartz,” Holmes County Farmer (Ohio), 10 March 1904, p. 1. John Schwartz was the first born child of Niklaus Schwartz and his first wife Elisabeth (Kunz) Schwartz. According to the town of Biglen birth abstracts, John was born on March 4th, not the 11th. 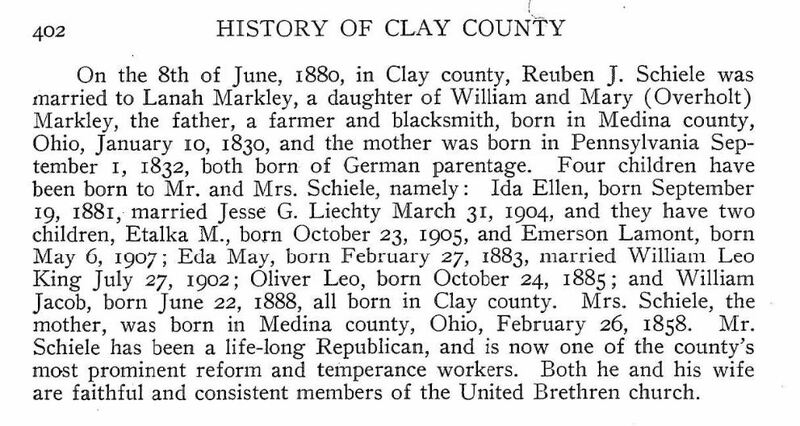 He married Mary Pauline Rohrer on 14 August 1862 in Holmes county, Ohio. John appears to be the only son who chose neither medicine or the law as a profession, but remained a farmer. John and Mary had 10 children: Savilla, William, Elizabeth, John, Catherine, Christian, Lydia, Charles, Elsie and Joseph. John and Mary are buried at the Trail Swiss Church Cemetery in Winesburg, Ohio. If you are the owner of this photograph, please contact me so I may provide proper attribution. 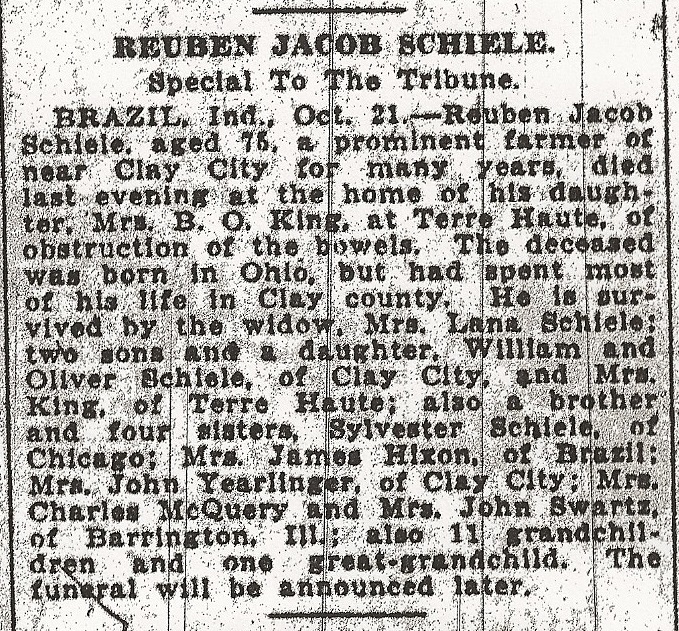 This entry was posted in Genealogy, Schwartz, Sunday's Obituary and tagged Holmes County, Holmes County Farmer, John Schwartz, Mary Pauline (Rohrer) Schwartz, Sunday's Obituary on January 26, 2014 by Deborah Sweeney. Dr. Henry Albert Schwartz, son of Nichols and Barbara Schwartz was born in Berlin, Holmes county Ohio, Oct. 6th, 1857. When still a young man he became a member of the Reformed church. He studied medicine at Western Reserve University, from which school he graduated in 1886. 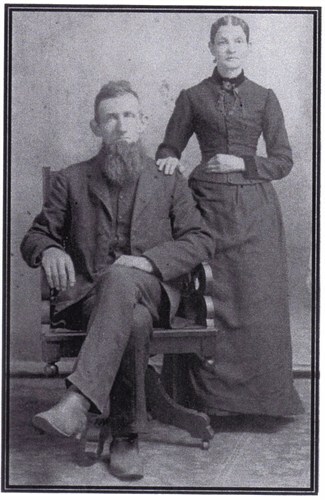 On April 17th, 1895, he was united in marriage with Miss Anna Etrang [sic Strang] at Millersburg, Ohio. Dr. Schwartz practiced medicine first in Indiana. Afterward he located at Greer, Ohio, and finally moved to Loudonville, where he has resided for the past eighteen years. After an ailness of but a few days he departed this life at 3 o’clock, Thursday morning, March 19, 1925, reaching the age of 67 years, 5 months and 13 days. He leaves to mourn his departure his sorrowing wife, and one daughter, Mrs. C. E. Swartzwalder. He is also survived by one grandchild, two brothers and one half-brother, beside other relatives and friends. Funeral services, conducted by Rev. J. H. Kuhlman, were held at Zion Lutheran church, Sunday, March 22 at 2 p.m. Interment in the Loudonville cemetery. “Watch ye, therefore, for ye know not when the Master of the house cometh”! 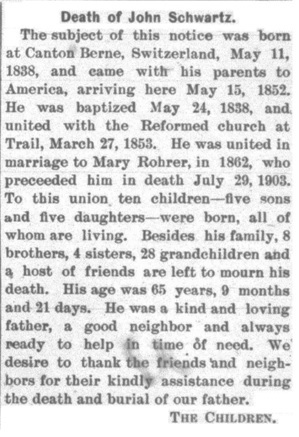 “Obituary of Dr. Schwartz,” Ashland-Times Gazette (Ashland, Ohio), 25 March 1925, p. 7. Dr. Henry A. Schwartz was the son of Nicholas Schwartz and his second wife Barbara (Kunz) Schwartz. He was born in Ohio, 6 years after the family emigrated from Switzerland. The obituary gives Henry a fairly good biography so there isn’t much more to add. Henry and his wife Anna are buried at the Loudonville Cemetery. This entry was posted in Schwartz, Sunday's Obituary and tagged Anna (Strang) Schwartz, Anna Barbara (Kunz) Schwartz, Ashland, Ashland-Times Gazette, Dr. Henry A. Schwartz, Loudonville, Niklaus Schwartz, Ohio, Rev. J. H. Kuhlman, Ruth Margaret (Schwartz) Swartzwalder, Sunday's Obituary on January 19, 2014 by Deborah Sweeney. Little Eugene Yagerlehner, son of Mr. and Mrs. Frank Yagerlehner, passed away last Saturday at the home of his parents on D street. The little fellow had been ill for some time, and not long ago underwent an operation which failed to prolong his life. He was 8 years and 7 months of age, the brother of Vera Yagerlehner and the grandson of Mrs. Etta Lake, and the nephew of Mrs. Sabin Kane, Mrs. Charles Vaughan, Mrs. Raymond Proctor and Mrs. Myrta Peterson. The funeral was held Tuesday from the residence of the parents, with burial in Mount Tamalpais cemetery. “LIttle Boy Succumbs at Parents’ Home,” Marin Journal (San Rafael, California), 11 March 1920, p. 1, col. 4; digital image, California Digital Newspaper Collection (http://cdnc.ucr.edu : accessed 04 January 2014). And a few days before the obituary, the family published a notice that Eugene was ill and doing poorly. 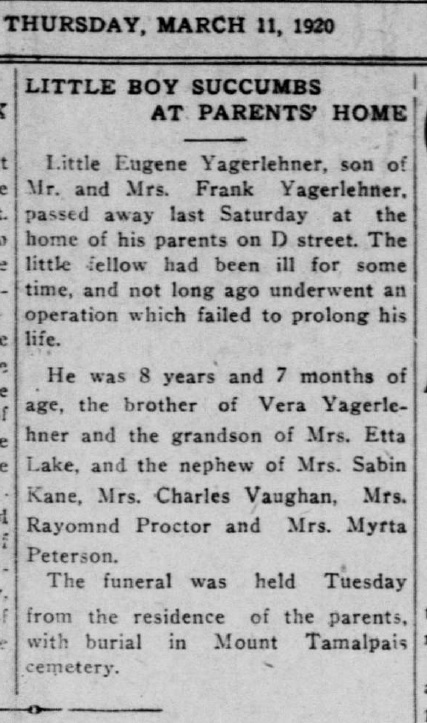 Eugene, the young son of Mr. and Mrs. Frank Yeglehner [sic], is reported to be seriously ill at his home. He recently underwent an operation at the San Rafael Sanatarium. “Local Happenings,” Marin Journal (San Rafael, California), 4 March 1920, p. 5, col. 1; digital image, California Digital Newspaper Collection (http://cdnc.ucr.edu : accessed 04 January 2014). 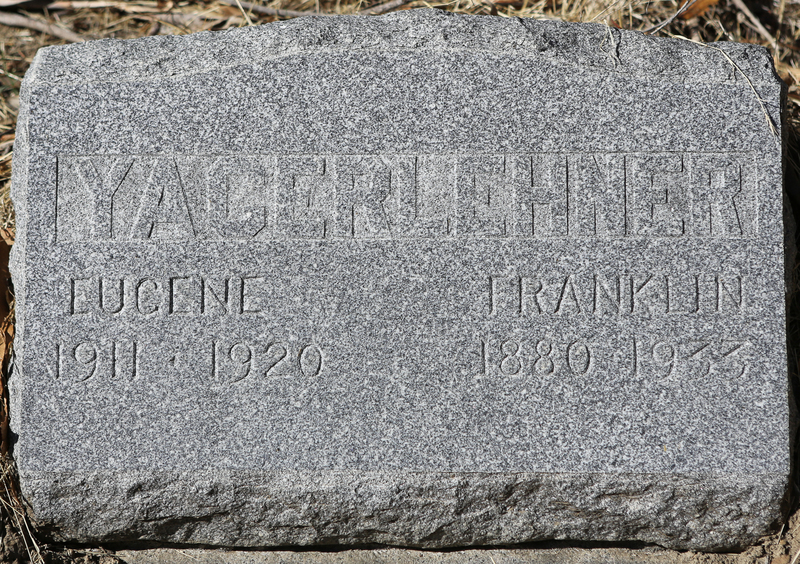 Eugene Yagerlehner was the only son of Frank and Lottie (Lake) Yagerlehner. He was born 11 August 1911, Marin County, California. He died on 6 March 1920 at the family home in San Rafael. Eugene is buried with his father at Mount Tamalpais Cemetery. This entry was posted in Genealogy, Sunday's Obituary, Yegerlehner and tagged Eugene Yagerlehner, Franklin Yagerlehner, genealogy, Lottie (Lake) Yagerlehner Holbrook, Mount Tamalpais Cemetery, San Rafael, Sunday's Obituary, Vera Jeannette Yagerlehner on January 5, 2014 by Deborah Sweeney. Mrs. Mary E. Yagerlehner, 70 yrs. old, died at the Boulevarde sanitarium at Detroit, Mich., at 8:40 o’clock Sunday morning. Death was due to infirmities of age, hastened by suffering a fractured leg two weeks ago. She had been an invalid for a number of years and was taken to the sanitarium two years ago. Mrs. Yagerlehner was born at Liberty Center, Ohio, November 27, 1846 and her early life was spent there. 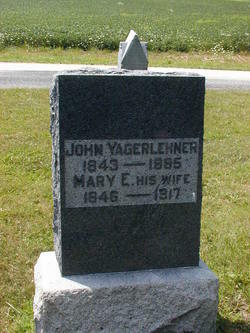 On June 3, 1866, she married John Yagerlehner. They lived there for thirty years and then came to this city, where she lived until she was taken to Detroit two years ago. Seven sons Charles, of Detroit, William of Ft. Wayne, Wilson and Frank of California, Edwin of Denver, Colo., John of Detroit and Irvin of Largo three daughters Mrs. Harry Story, of Wabash, Mrs. John Urschel of Tippecanoe and Mrs. Charles Clemens of Marshfield, Ore., two brothers, W. C. Wright of Wanseon, O., and James Wright of Liberty Center, O., a sister Mrs. Ella Dandy of Liberty Center, O., survive. The funeral will be held Wednesday afternoon and the burial will be made in the Hopewell cemetery. The services will be held at the Hopewell church at 2 o’clock. The Rev. Frost of the Presbyterian church at Lagro will officiate. “Lingering Illness Ends in Death,” Wabash Plain Dealer (Wabash, Indiana), 4 September 1917, p. 1, col. 1; digital image, Newspaper Archive (http//www.newspaperarchive.com : accessed 14 December 2013). The funeral of Mary E. Yagerlehner was held Wednesday afternoon with burial in the Hopewell cemetery north east of Lagro. The services were held at the Hopewell church at the cemetery at 2 o’clock, the Rev. Frost of Lagro officiating. The funeral was largely attended and the ceremonies were most impressive. Those who acted as pall-bearers were: four sons Charles of Detroit, William of Ft. Wayne, Ervin, of Lagro, John of Detroit, two brothers N.C. Wright of Wauseon, O., and James Wright of Liberty Center, O. 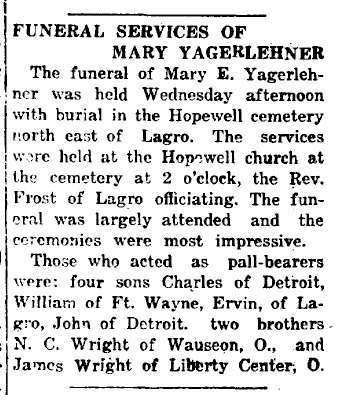 “Funeral Services of Mary Yagerlehner,” Wabash Plain Dealer (Wabash, Indiana), 6 September 1917, p. 1, col. 7; digital image, Newspaper Archive (http://newspaperarchive.com : accessed 14 December 2013). This entry was posted in Sunday's Obituary and tagged Alice (Yagerlehner) Clemens, Charles Yagerlehner, Edwin Yagerlehner, Ella (Wright) Dandy, Emma (Yagerlehner) Story, Florence (Yagerlehner) Urschel, Franklin Yagerlehner, Irwin Yagerlehner, James W. Wright, John Yagerlehner, Mary E. (Wright) Yagerlehner, Nathan C. Wright, Sunday's Obituary, William Yagerlehner, Wilson Yagerlehner on December 15, 2013 by Deborah Sweeney.